As the environmental protection requirement and the large scale of sand and stone aggregates production line becomes more and more strict, when design the complete set of production line, we should consider the raw materials, finished products, space environment, environmental protection requirements, construction cost and operating costs. Firstly, in process design stage, it must consider the site actual situation, such as raw material, output, finished products, and site scale. The equipment layout should be compact, which is convenient for the later operation management. The crushing process should obey the principle of multi-crushing process, normally it has secondary crushing, tertiary crushing, and fourth crushing. The specific method should be determined according to the requirements of raw materials, output and finished product. 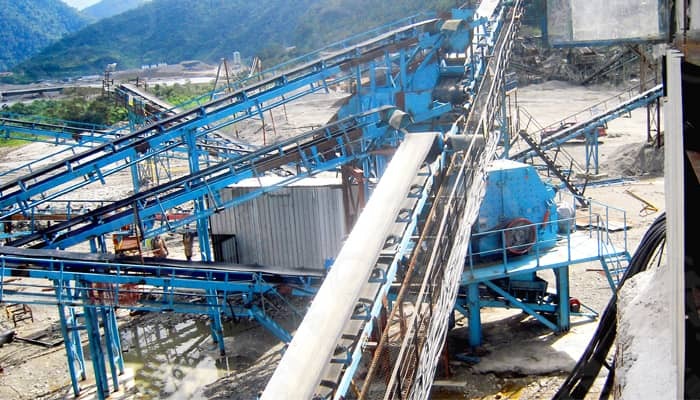 Secondarily, the crushing equipment should be selected according to the different raw material. It needs to be noted that the selection of equipment should consider the design output to choose the equipment with matching capacity. At the same time, we should also consider the feeding requirement. The materials crushed by front machine must meet the feeding requirement of the subsequent equipment to prevent material blocking. Thirdly, the screening machine can choose the large size if possible, full and effective screening can not only select the qualified products, but also improve the output. Fourthly, the design of finished products yard. It can be designed into manually loading and automatic weighing loading system. Automatic weighing loading system can enhance the loading efficiency and reduce the labor cost.